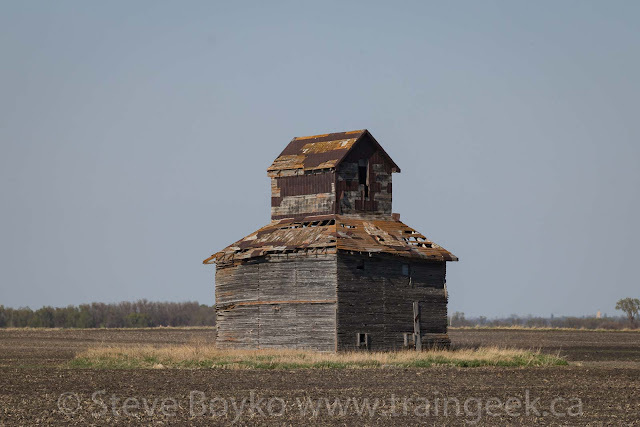 Recently someone asked me about the status of a caboose near La Rivière, Manitoba. This caboose was at the Archibald Museum, which is located northeast of the town. The museum closed in 2016 but it's not clear what happened to the collection. Time for a road trip! I convinced my family that this was a good idea. 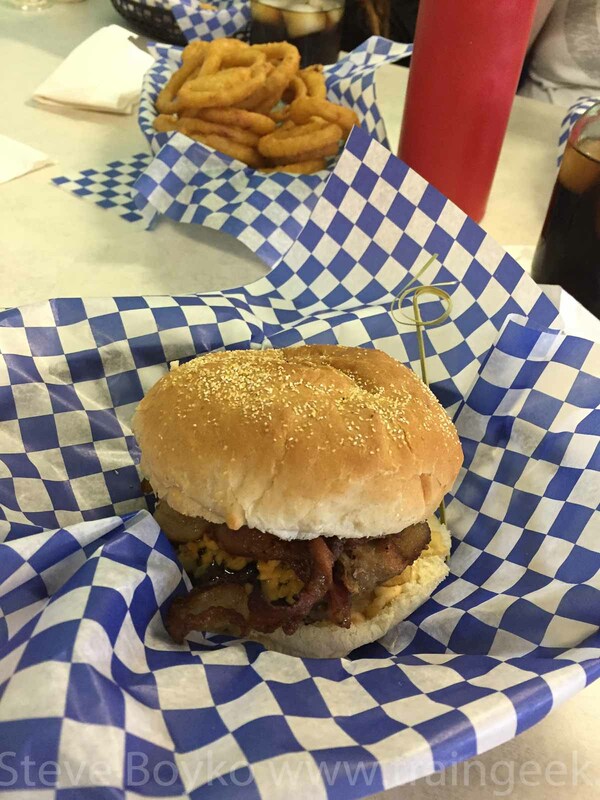 My wife always wants some kind of destination, so we decided to have supper at GG's Drive Inn in Somerset. I read the reviews and it sounded like a good place. We hit the road after lunch on May 20th (a Sunday). 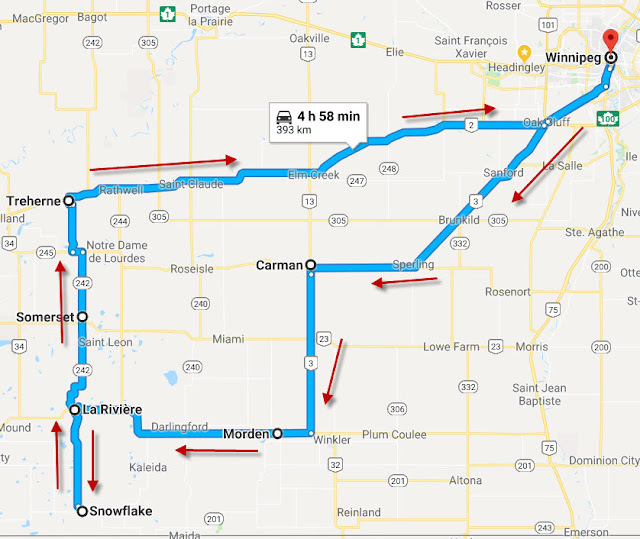 This is the route we took. Naturally I planned to return home by a different route. There were grain elevators to see! I took a photo of the Pioneer grain elevator near Brunkild, because I had seen some work being done to it the last time I passed through. I think it was just track work but it's always good to document when you can! 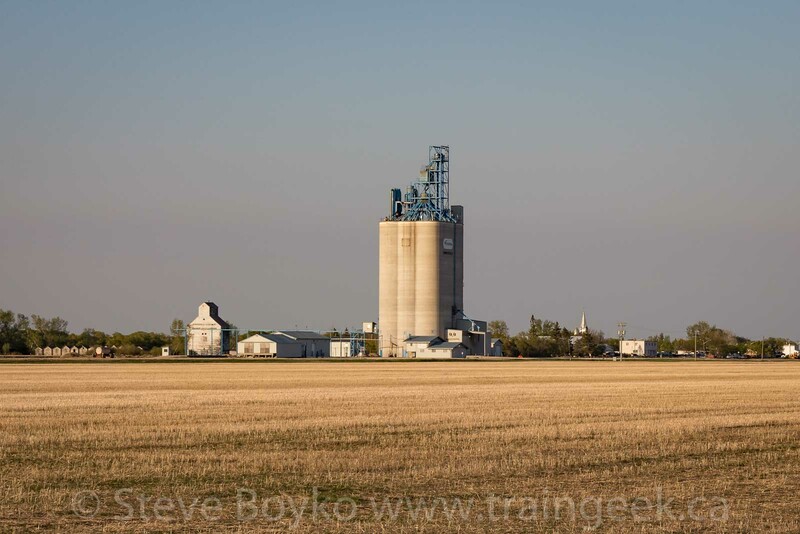 As we passed through Carman, I took a few photos of the yard area near Linear Grain. Linear's elevator is behind these two Cando / CEMR gondolas. 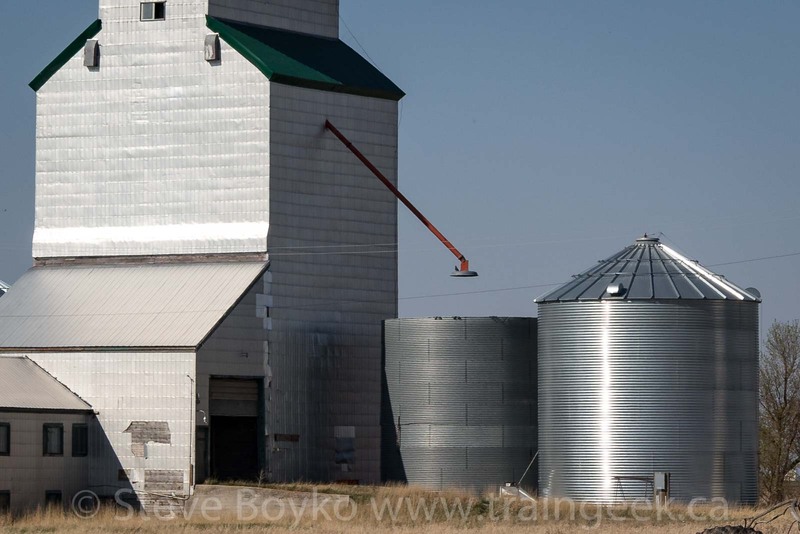 After we left Carman, we passed by Jordan's elevator en route to Morden and Manitou. 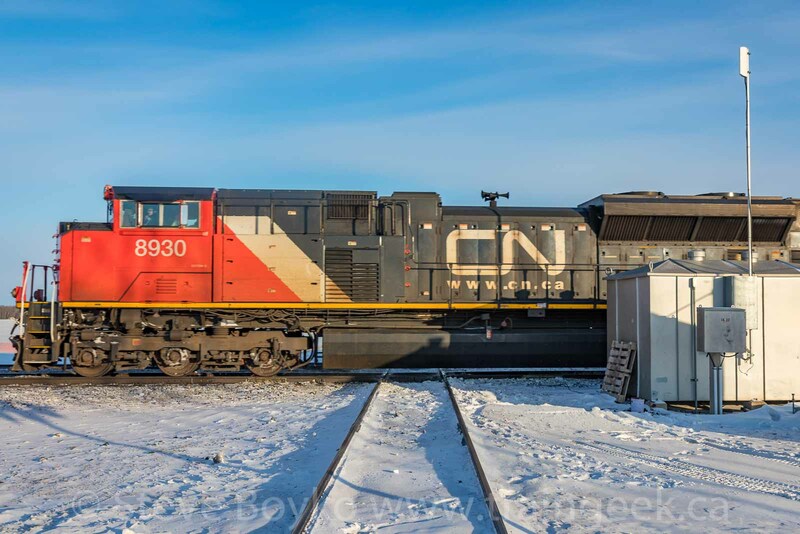 I stopped in Manitou to take some photos of Boundary Trail's two GP9 locomotives, ex GT 4625 and ex CP 8208. We carried on to La Rivière and immediately headed north. We headed north on route 242, which is a gravel road. The former museum is located a few kilometres outside town, basically in the middle of nowhere. I knew the museum was closed. 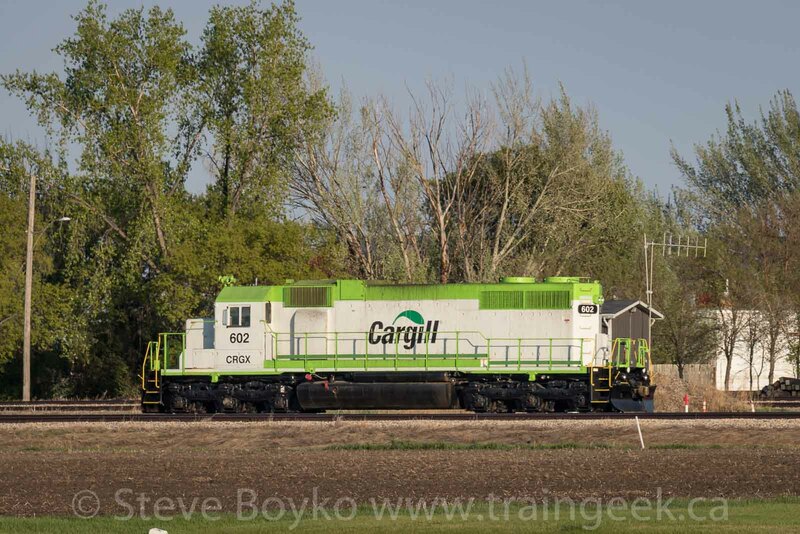 My intention was to see what was left - from the grid roads around it - and see if I could spot the caboose. I stopped by the former entrance and photographed a monument there. It documents the Wallcraft Homestead, founded in 1878. As I finished doing that, one of the property owners drove up. I introduced myself and told her why I was there. I understand they are very concerned about vandalism and theft and I assured her I would be taking my photos from the road. We had a brief conversation and she left. I didn't see the caboose, but I did take this long distance photo of the former La Rivière train station, which was moved here. This station is fairly unique. 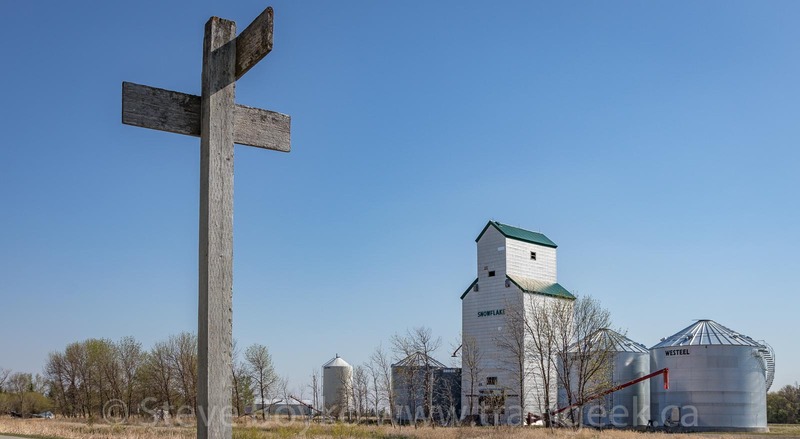 It was built in 1898 and is the last Canadian Pacific plan #3 station remaining in Manitoba. Its mansard roof is a unique characteristic. It's a shame it's not open to the public, but that's the choice of the owners. There's a school marker nearby, which I wrote about in a guest post on Everybody Has To Be Somewhere. 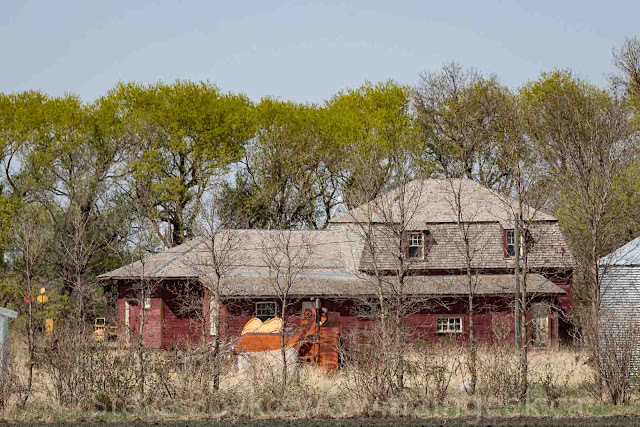 That's a blog you should read if you like abandoned places. I mentioned that the town of Snowflake was pretty close. My wife was agreeable, so we turned south and drove there. Snowflake is my favourite Manitoba ghost town. It has two grain elevators and several interesting abandoned buildings. The Federal grain elevator is pretty special. It isn't exactly a real ghost town, because there are a few houses still occupied. 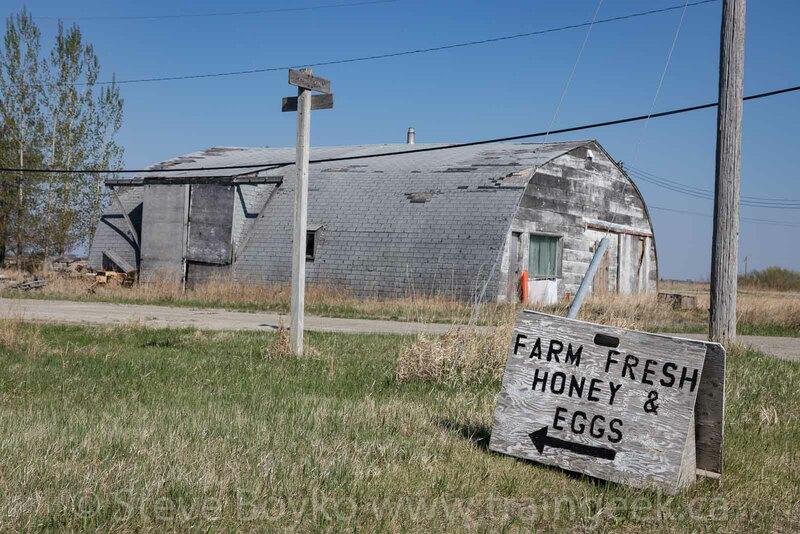 In fact, there was a sign on the highway directing people here for "FARM FRESH HONEY AND EGGS". I thought I heard music coming from this building. Regardless, nobody was visible when we visited here. 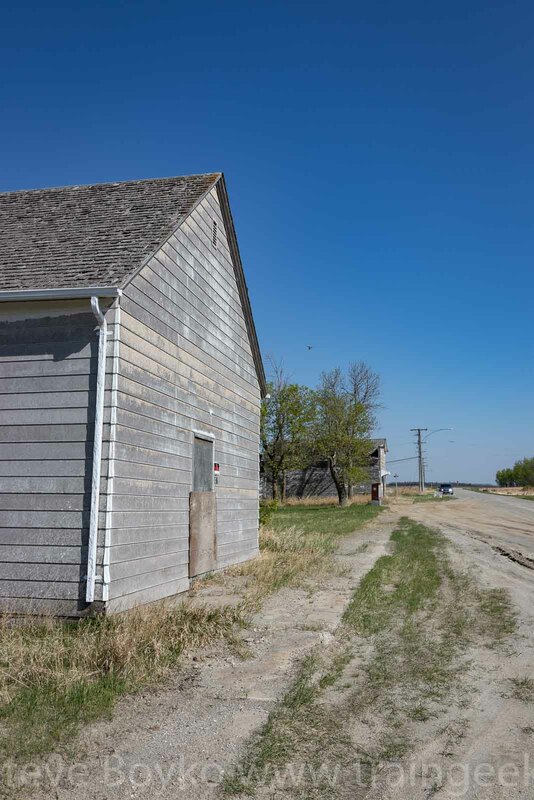 The town has several old businesses along the main street, which is fairly unusual as these tend to get torn down as prairie towns decline. A few of the buildings have prominent NO TRESPASSING signs on them. After the CP Snowflake subdivision was abandoned in 1977, the town declined. The school closed in 1992 and the United Church closed in 1994. There is still a community centre building but I am not sure if it is still used. There are markers for the church and school in the town, and the bell from the school is mounted on a stand. My children were happy to pose by it. 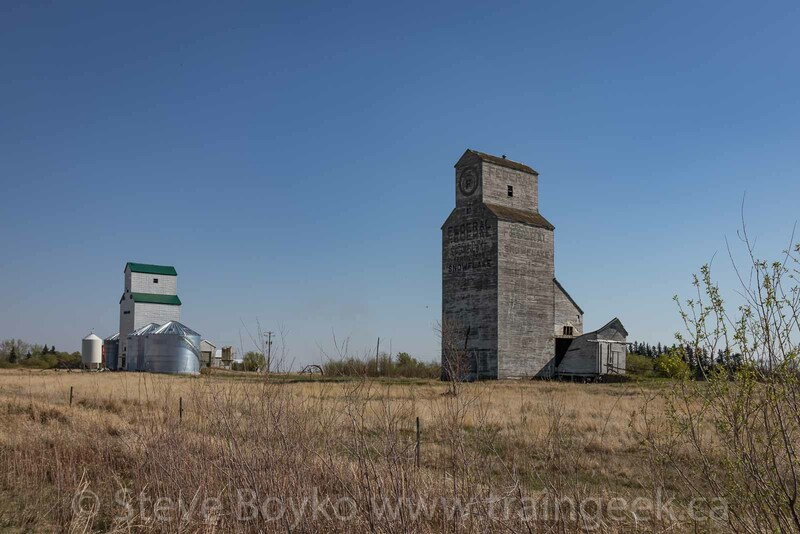 The stars of the town, from my point of view, are the two grain elevators. 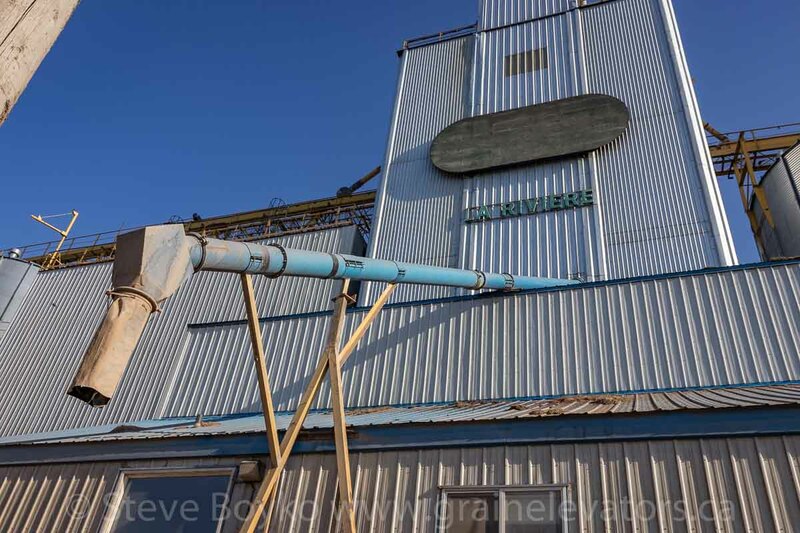 Note the spout on the silver elevator, hanging in mid-air. I don't know what happened to the top of that bin! The Federal elevator is looking a little worse than it did when I visited in 2014. I never actually wrote about my trip to Snowflake on this blog. I did write about it in Ten Grain Elevator Towns on the Trackside Photographer site, and David Gagnon wrote about his visit to Snowflake in 1989. As we drove north from Snowflake, we passed this little barn? elevator? which is located in a field near the highway. It's looking a lot worse than it did in 2014. 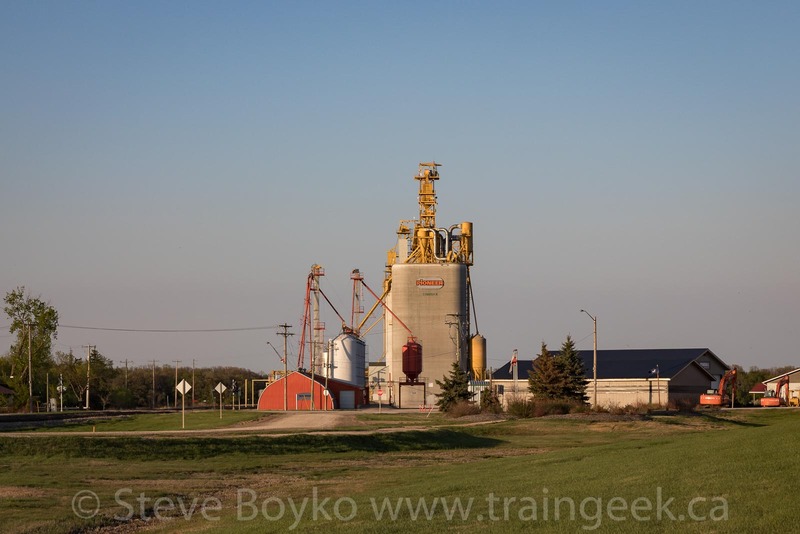 The two steel grain elevators at Somerset are looking good. 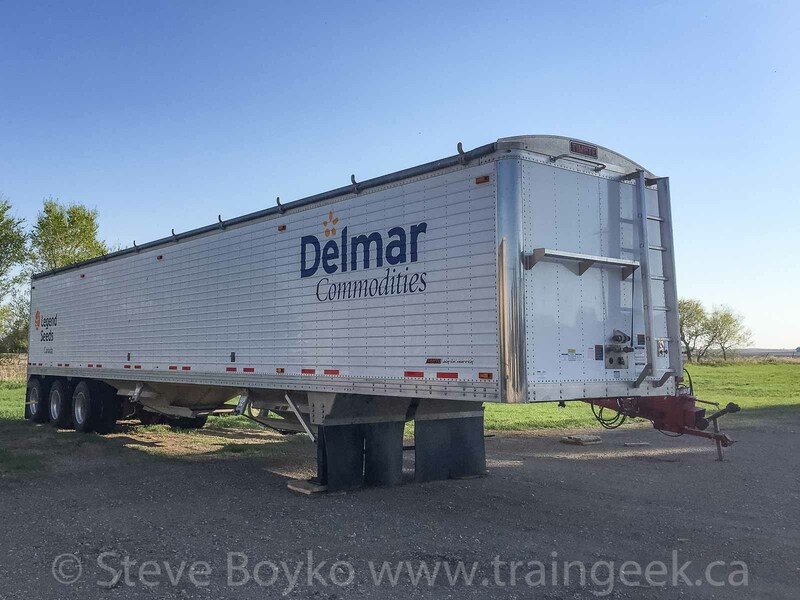 These elevators are owned by Delmar Commodities, who moved one of these elevators from La Rivière to here when the CP La Rivière branch was being abandoned. At that time, Somerset was served by the Southern Manitoba Railway, but unfortunately the SMR folded and now Somerset has no rail service. The elevator still has the La Rivière name on it. There was a Delmar Commodities truck trailer near the elevators. We went to GG's Drive Inn and had a great meal. I had this tasty burger and we shared some onion rings. If you're ever in the Somerset area, drop in for a meal! After our meal, we headed north to Rathwell, then headed east along highway 3 to Winnipeg. 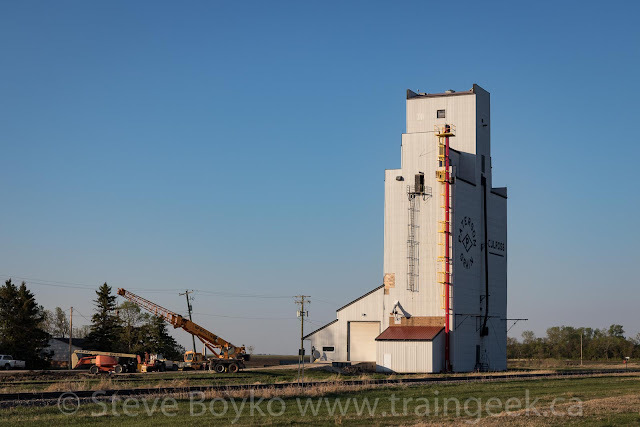 Along the way, I photographed the elevators in Elm Creek, Culross, Fannystelle and Starbuck in the sweet evening light. There was some work being done to the Culross elevator. Note the small elevator to the left of the Viterra elevator, below. Cargill, Paterson, Viterra and Pioneer - most of the big names in grain in Manitoba. I wrote a post about the grain elevators of the Glenboro subdivision back in 2014. Trains and Grains, at the La Salle, Manitoba grain elevator. Sadly no train came along to complete the picture. This is a review of Trains and Grains Volumes 1 and 2 by Eric Gagnon. I've been eagerly awaiting these two books since Eric announced them back in September 2017. 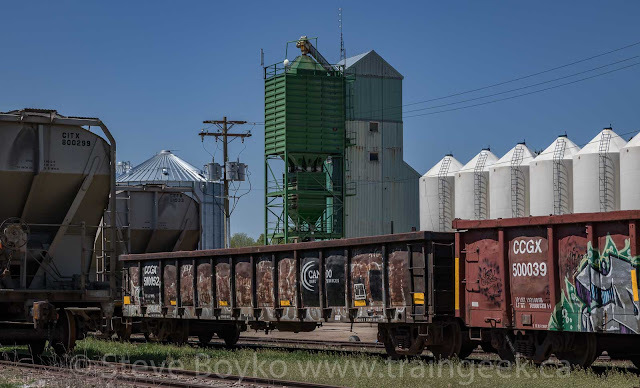 I love both trains and grain elevators, so it almost felt like these books were written for me... or at least people like me. I'll put a few disclaimers here - I received these books for free as a "thank you" for writing the foreword for volume 2. I also consider Eric a friend. I wouldn't let either of these stop me from writing an honest review. Finally, I received no compensation for writing this review nor do I receive anything for recommending the books, and Eric didn't ask me to write a review. These two books are centered around Eric's visits to Manitoba and Saskatchewan between 1976 and 1986. Eric's aunt and uncle lived in Portage la Prairie and he did a lot of railfanning during the days he was in Portage. Later, he visited many of Saskatchewan's elevators, realizing that they were disappearing fast. Eric had so many photos to share from that decade that he split them into two books! Volume 1 is subtitled "Trackside Observations in Manitoba 1976-1986". 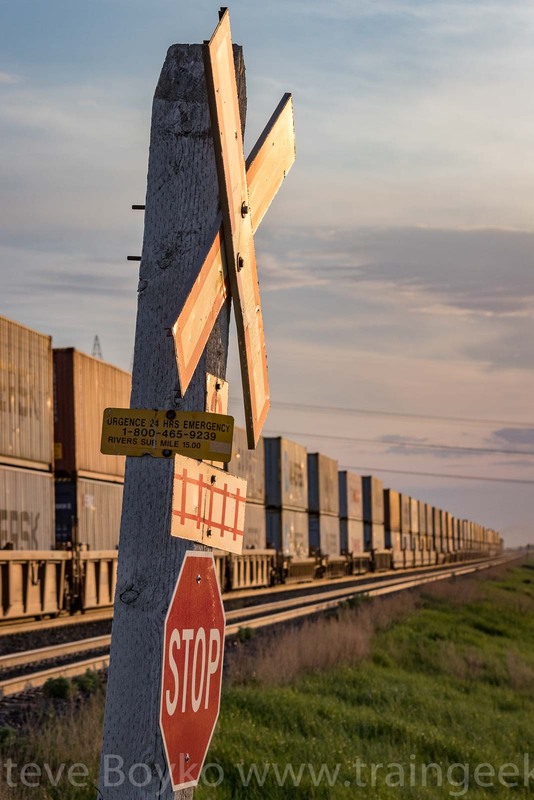 The first half of the book features trains that Eric recorded in and near Portage la Prairie, Manitoba during that period while visiting his aunt and uncle. Eric is a meticulous record keeper and the captions of the many black and white photos are detailed, interesting and absolutely alliteral, again and again. The train photos were shot from a variety of angles, most from the ground, with some overhead views from the Tupper Street overpass. 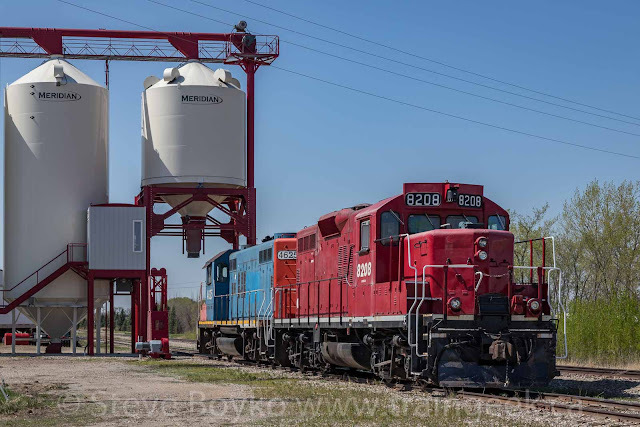 An article by Mark Perry on "Working CN Grain Wayfreights"
The foreword is by Randy O'Brien. This is a great book, chock full of interesting photos and interesting details. It took me a while to read due to the dense information content, and I plan to read it again to catch the things I missed the first time. Volume 2 is subtitled "Grain Elevators in Manitoba and Saskatchewan 1976-1986". 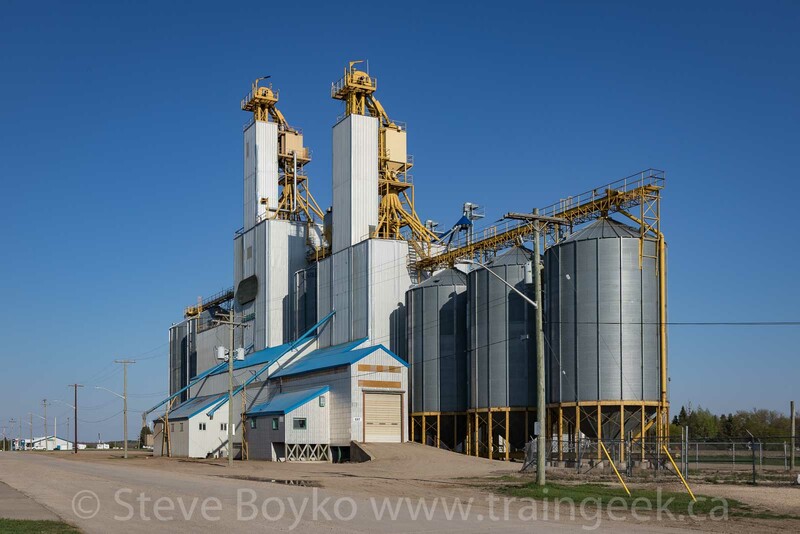 The first portion of the book talks about the history of the grain industry in Canada, and how grain elevators are built and operate. 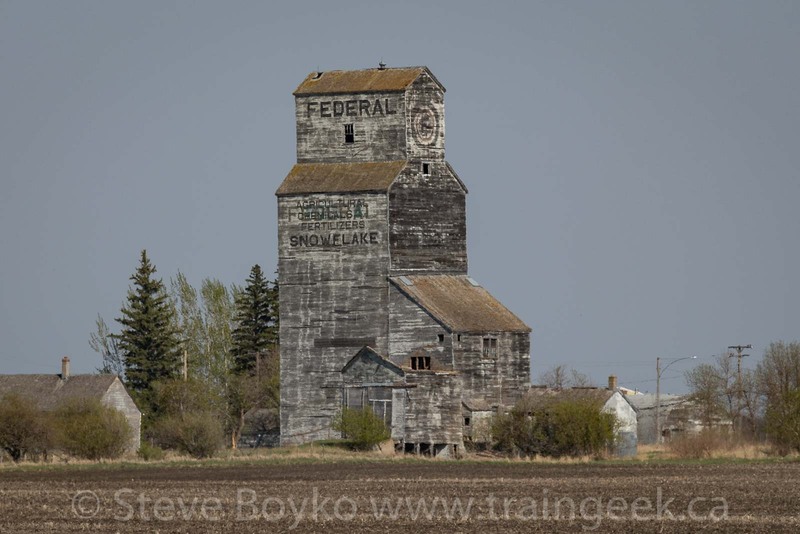 This section is relatively brief, and more than half of the book features black and white photos of grain elevators from Eric's trips to Manitoba and Saskatchewan to document many of the wooden elevators still standing. The foreword is by yours truly. I would honestly consider volume 2 a companion to volume 1. There is a lot less text in volume 2 and I read it much faster than volume 1 because of that. I don't consider it any less valuable, though! The photographs in this book are what I would call "documentary". 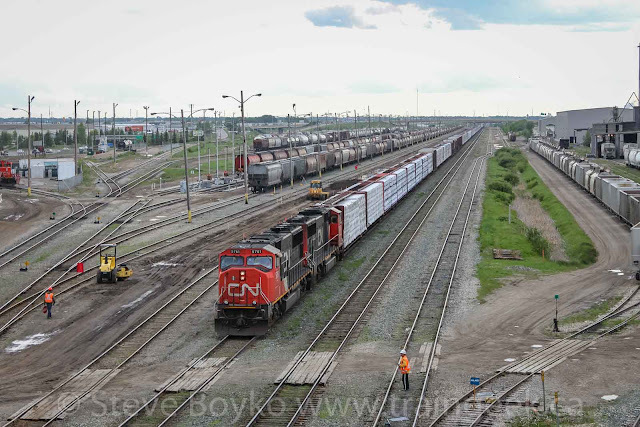 They were clearly taken with the intent of documenting the trains and grain elevators - and the scene around them. These are not "coffee table" picture books full of lovely sunset photos. 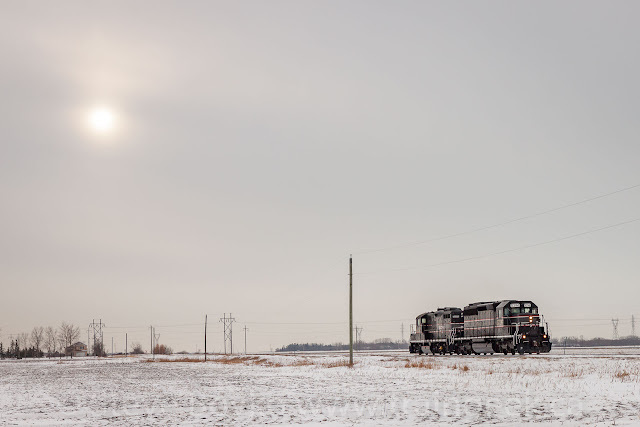 That doesn't make them any less valuable - in fact, I would argue they are more valuable than "arty" photos because they thoroughly document the trains and grain elevators of an era long past. These books are fantastic reference materials for anyone interested in understanding the mid 1970s to mid 1980s railroad scene, and especially for the modeler (like me) who wants to run realistic trains. I was surprised by several photos - for example, a few stock cars were still in evidence, even though I had thought the railways were out of the livestock business by then. 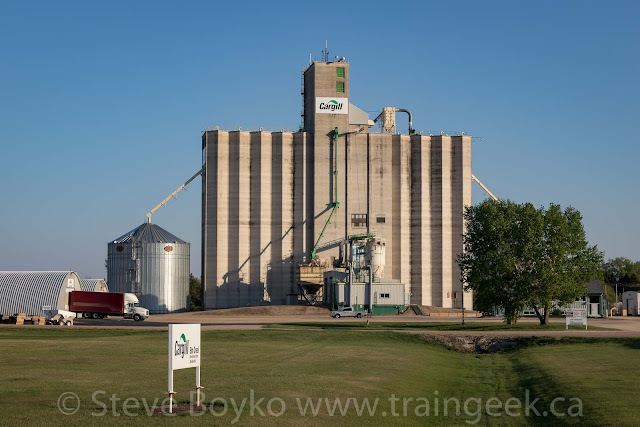 The grain elevator photos are especially valuable as many of these elevators simply do not exist today, so there is no opportunity to see them in person. Volume 2 in particular provides a way to experience the elevators of the past. 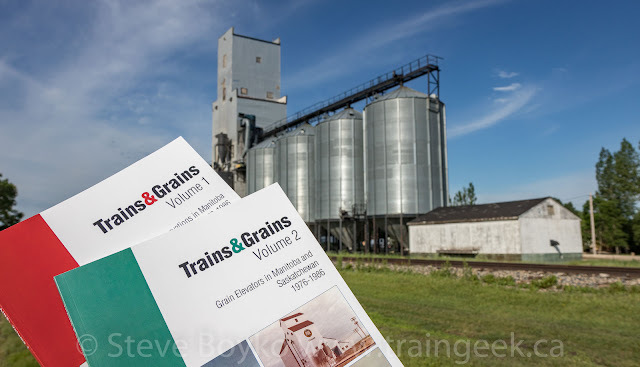 Both of these books are well worth purchasing by anyone interested in Canadian railway history or Canadian grain elevators. You can buy the books from Eric at https://trainsandgrains.blogspot.com/ - the order form is there, or you can email Eric using the email at top right of that page. In every vocation and every hobby, you get better at what you do with practice. You level up. 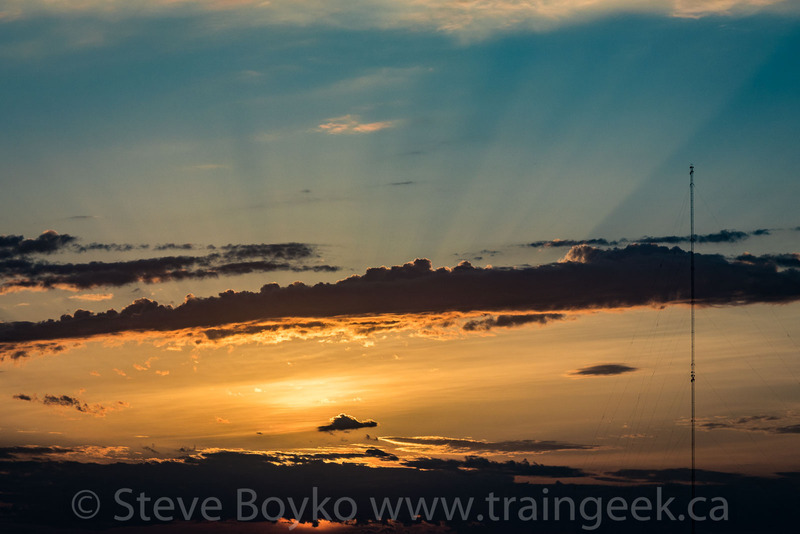 Sometimes this is imposed on you - you get reassigned to a new position at work, or your boss gives you more responsibilities and you have to learn more skills - and sometimes you do it yourself by getting training or watching videos on YouTube or whatever. Don't be satisfied with one photo. Try a different angle. Lay down on the ground. Shoot through something as a frame. Try it from the non-sun side. Turn your camera 90 degrees. Turn it 45 degrees, even.